8 Edge-lit exit sign designed to New York City specifications, provides superior aesthetics in a surfacemount design. Excellent LED performance and energy efficiency combined with infield installation flexibility. 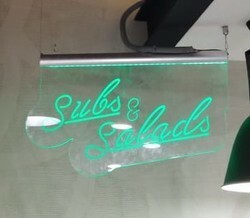 Edge-lit sign of size(lengthwise) 12/ 18/ 24 are made of imported clear acrylic sheet of 10mm / 15mm cut & frosted as per design with powder coated aluminium suction base. Lighting shade is done with one standard make tube light. - LED Edge Panel Lights made with high quality super flux led and aluminum profile and other fitments. - LED edge slim light LED Panel are available in basic colors-Red, Blue, Green, Yellow and White. - Also available in RGB multicolor changing option. - Available in 12", 18", 24", 36", 48" and other sizes on request. - Also available in a table top version. In order to fulfill the ever changing demands of our clients, we have been engaged in manufacturing and supplying Edge Lit Signage. This range is manufactured by our experts employing advanced technology. Available in various sizes, designs and colors.